A tender, magical story about 12 year old Izzy Roybal who is sent to spend the summer in her nana’s New Mexico village where she is soon caught up in the foreign world of her own culture, from patron saints and soulful food to the curious and magical blessings Nana gives her tortillas. In Nana’s village she meets Mateo, the adventurous, treasure seeking thirteen year old boy who lives on the other side of the bolted door in Izzy’s bedroom and six year old Maggie who is raising her cat, Frida, as a dog and sees marshmallow ghosts float out windows. When the wind begins to whisper to Izzy, she is soon led on an adventure to learn about her father’s mysterious death, who she really is, and to connect the hidden pieces of her past. Several months ago, I signed up to participate in The Story Siren's 2010 Debut Author Challenge. 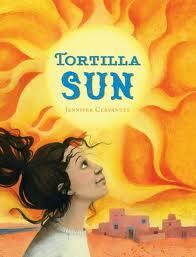 I will add admit that Tortilla Sun by Jennifer Cervantes was a late addition to my list of Debut Authors. However, I am so thrilled that I found this absolutely lovely book. If you hang around me for any length of time, you will know that trying to find books that my students will relate to is a big concern of mine. The majority of my students are from Hispanic backgrounds. Many are Mexican American. There are some but not enough stories that feature Latino characters. I was barely a chapter into Tortilla Sun when I knew that this was a book that I not only wanted to share with my students but that I would use as a read aloud with my fifth graders. By now you may be wondering, what is so special about Tortilla Sun? Cervantes has created a story filled with well-developed characters, a vibrant setting, and a message of loss, love, family, and hope (pull out your tissues when reading this - I sobbed for nearly the last 1/4 of the book). Twelve year old Izzy never met her father who died before she was born. Her mother and she have never settled into one house or an apartment for any extended time. After moving into yet another new place, Izzy uncovers a box of things that belonged to her father including a baseball with the worn words "Because____ ____ magic". Shortly after this discovery, Izzy's mother is called away on a research trip and sends Izzy off to spend the summer in New Mexico with her grandmother. At first Izzy is unhappy with this decision but shortly after arriving she discovers that the summer may be a time where she can learn about who her father was and what are the missing words rubbed off from the baseball. From her Nana, she discovers the magic of homemade tortillas, and learns that the past needs time to be revealed. From 13 year old Matteo and 6 year old Maggie, she learns about friendship, adventure, and caring about others. From the adults that surround her in this small village, she learns to embrace the magic around her and discovers who she is. Cervantes also weaves together Spanish words and phrases along with wonderful references to food and activities that further embrace the Latino culture. This coming of age story is beautifully and masterfully told. Cervantes has hit her own home-run with this debut offering and I am eager to read any future books from her. In "2010 Debut Author Challenge", "Book Reviews", "Chronicle Books", "Jennifer Cervantes", "Magical Realism", "Middle Grade Fiction", "Middle Grade", "Mock-Newberry 2011", "Read Alouds", "Tortilla Sun"